Today we are going to be looking at the musical alphabet, otherwise known as the chromatic scale. The chromatic scale contains all of the notes you will find on your guitar. The musical alphabet is similar to our english ABC alphabet but it doesn’t go past G, in fact after G we start again at A.
You’ll notice that after some of the notes we have another version of it with a little # symbol next to it. This is like a halfway step between that note and the next and is called a sharp. The note A# (A sharp), is like A and a half and then we move on to the note B. A, A#, B, C, C#, D , D#, E, F, F#, G, G# and then back to A. Some of the notes don’t have a sharp, namely B and E.
If we look at the piano keyboard below, we can see the sharps are the black notes on the keyboard. Click to hear the chromatic scale on the piano [Chromatic Scale]. Remember that I said B or E don’t have a sharp? You can see on the piano that B/C and E/F there are no black notes. Tip – you can remember this with the phrase “Never BE sharp”. 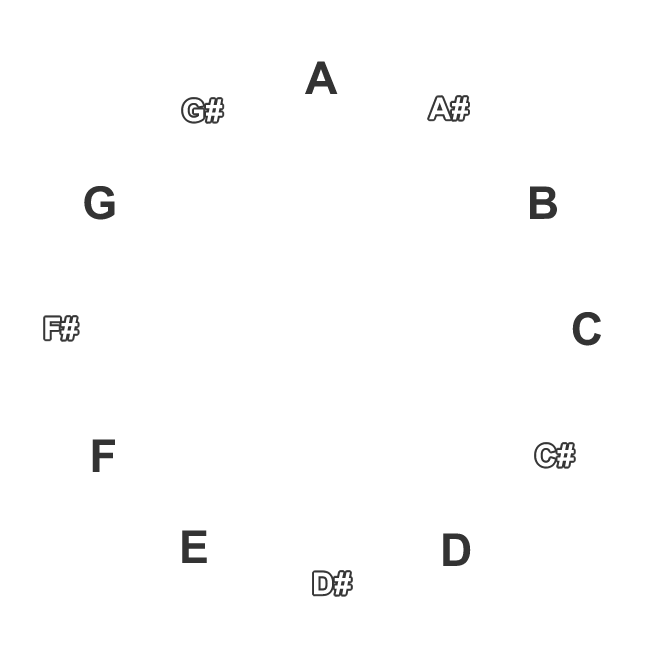 On the guitar we can apply the chromatic scale as the diagram below. I have written it along the A string so it goes in the same order as above. Note that the open A string is the note A and the first fret A# and so on. The fret on your guitar with the double dot (don’t worry if you don’t have this!) is the 12th fret. When you reach this fret you should be on the same note as the one where you started on the open string. If we were to apply the chromatic scale to a different string then we start counting from the note that string begins on. When we get to the note A (5th fret) we keep on counting past it to A# then B etc because we can’t stop until we hit the 12th fret, which should be the same note as when we began (the note E, like the open string). This way, if we start on any note (the B string for example) then we can keep counting round clockwise through all 12 notes until we end up back where we started. Try playing the chromatic scale on all strings and counting up as you go. Make sure you start with an open string (E,A,D,G,B or e) and end up on the 12th fret back at the note you started. Join me next time when we will go through part 2 of the chromatic scale.